This month's message comes to you directly from the editorial team for a change! Here in the editorial office, cloistered away in the UK, editor-in-chief David Rawson, and myself have just returned from the 2014 World Forum on Biology, held this year in Savannah, GA. If you were unable to attend you can experience a taste of the proceedings in this issue's event report, kindly written by President-Elect, Jason Acker. For David and myself the meeting was a chance to catch up with the Board of Governors, and hear what is happening with the administration of the Society as well as the Board's plans for the future. We also held the annual editorial board meeting, taking a look at the year in review, as well as discussing matters of editorial significance. David was also kept busy with various symposia and chaired a session on oocyte and gamete cryopreservation. For me it was great to see many members again that I first met last year, as well as meet new members who have only recently joined the society, or who were unable to attend our 50th anniversary meeting last year. As I'm in contact with you, our members, so often, it's nice to be able to put a face to your names. Likewise, I'm sure you appreciate knowing who's at the other end of the cryobiology email address. I thought I would take this chance to let you know that both David and myself would thoroughly welcome your input into the newsletter. If there's ever anything you would like to see included all you have to do is drop us a line at [email protected]. This covers anything from news, reviews, articles, event reports, training opportunities, events and conferences, personal successes, student successes, milestones - pretty much anything you can think of! If you're currently researching something novel let me know. I'd love to profile your group in a forthcoming issue of Newsnotes! It's almost election time again! Later this year an election will be held for three members of the Board of Governors, to replace outgoing Governors Eric James, Barbara Reed and Andreas Sputtek, who are coming to the end of their three year term on the Board. As usual the nominating committee will draw up a short list of candidates, but the Board also welcomes nominations by petition, with any current member of the society eligible to stand for election. More information will be forthcoming over the next few months, including a list of candidates and their statements, as well as further information on the voting procedure. It is anticipated that the voting period will be from September until October, with announcement of the successful candidates in early November. For more information on nomination by petition, or if you would like to be considered by the nominating committee as a candidate, please contact society secretary, Dr. Yuksel Agca. 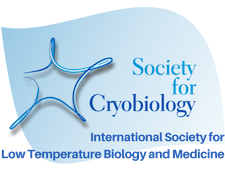 The 51st Annual Meeting of the Society for Cryobiology was held this year at the Hyatt Regency Hotel in the beautiful city of Savannah, Georgia, USA from May 31 – June 4. This year, approximately 400 members from the Society for Cryobiology and the Society for In Vitro Biology joined together to discuss the latest trends in animal, plant and low temperature biology. The 4-day scientific program had a total of 332 abstracts, with 117 being delivered by the invited speakers. Each day started with a Plenary Symposium to engage the participants in a “hot topic” or broad reaching area of science that would appeal to the diverse interests of the attendees. The Society for Cryobiology sponsored the Plenary Symposium entitled “Climate Change, the Cryosphere and Cryopreservation” with Drs. Diana Wall, Mary Hagedorn and Valerie Pence highlighting the enormous value that cryobiology plays in understanding and helping us protect against climate change. Following the daily Plenary Symposium, there were a series of parallel sessions to keep participants engaged and actively moving between rooms. The highlight of the meeting was the Keynote Presentation by Dr. Pierre Comizzoli from the Smithsonian Conservation Biology Institute. Dr. Comizzoli delivery an excellent presentation on “Technology and Ecology Aspects of Genome Resource Banking”. The keynote presentation was followed by the meeting opening ceremony and a reception where members from the two societies could meet and engage in lively discussion. The 120 students and trainees attending the meeting were kept busy attending the sessions and participating in the student-focused activities. Sessions on “Effectively Communicating Science” and a student-networking luncheon were aimed at engaging with the newest members of our society and to provide them with opportunities for professional development. Competition for the best poster and the Peter L Steponkus Crystal Award was fierce as the quality of the science and the presentations was very high. As a joint meeting with the Society for in Vitro Biology, special attention was made to create networking opportunities for the members of the two societies to come together and discuss topics of common interest. Plenary symposia, joint receptions, poster sessions, and a joint tour of Old Fort Jackson, kept the discussion going long after the scientific sessions ended. At this year’s annual meeting, we continued the practice of partnering with our colleagues at the International Society for Cellular Therapies and the American College of Cryosurgery to bring together cryobiologists with the end users of the cryosciences. The two sessions of the cryopreservation of cell therapies and cryosurgery were very well attended and resulted in stimulating discussions around how we can further work together on applied aspects of cryopreservation. The organization of a meeting of this scope cannot occur without the commitment of a large group of members and volunteers. This year, we worked very closely with Dr. Michael Spencer and the SiVB program committee and Marietta Ellis and her team from New Beginnings Management Inc. to organize the meeting. We are grateful for the sponsorship and participation of the commercial exhibitors who introduced us to their technologies, programs and products. An enormous “Thank you” to the SfC members and volunteers who helped make this year’s meeting a success. 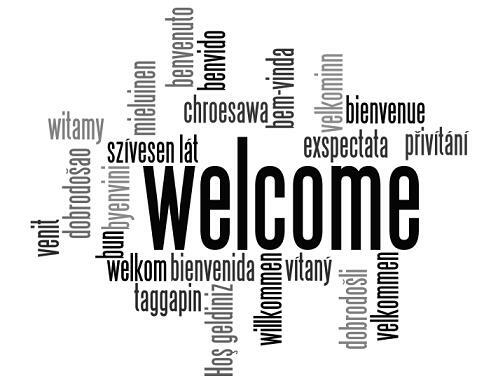 Stay tuned for an announcement on the location of the CRYO 2015 Annual Meeting. The society was pleased to announce at the recent AGM in Savannah that Greg Fahy has been nominated and approved as a Fellow of the Society for Cryobiology. Greg is the Vice President and Chief Scientific Officer of Twenty-First Century Medicine and is an expert in the field of organ vitrification. He has a publication record spanning over 35 years and is active in many areas of cryopreservation and vitrification. Above: Watch Greg Fahy's plenary lecture at Cryo2013 on Ice Formation. The SfC is proud to continue its support of our student members with our annual student awards. As always the awards committee had a difficult task in judging the awards, especially considering the breadth of topics submitted. 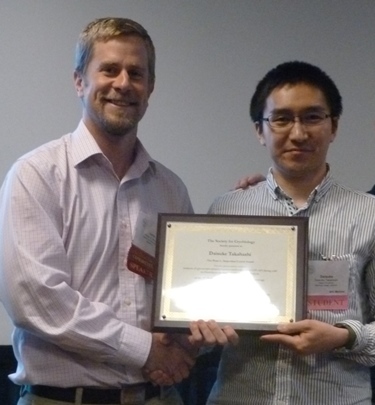 All the winners deserve our congratulations, but a special mention is in order for Daisuke Takahashi of Iwate University, Japan, who won both the Critser Award for best student abstract, as well as the Steponkus Crystal Award for the best student oral presentation, for his abstract and presentation: "Compositional and Functional Analyses of Glycosylphosphatidylinositol-anchored Protein (GPI-AP) during plant cold acclimation." Pictured right: Daisuke Takahashi with James Benson (chair of the awards committee). 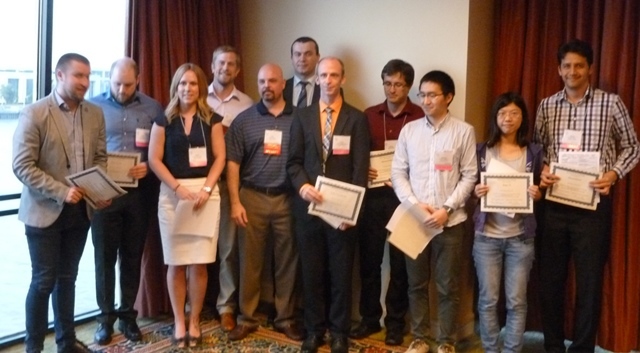 Our 2014 student award winners in full. Left - Right: Tim Morris, Pierre Lyons, Jennie Briard, James Benson (chair of awards committee), Erik Woods (SfC President), Oleksandr Gryshkov, Lothar Lauterboeck, Michael Zielinski, Daisuke Takahashi, Jingru Yi, and Ahmad Sultani.